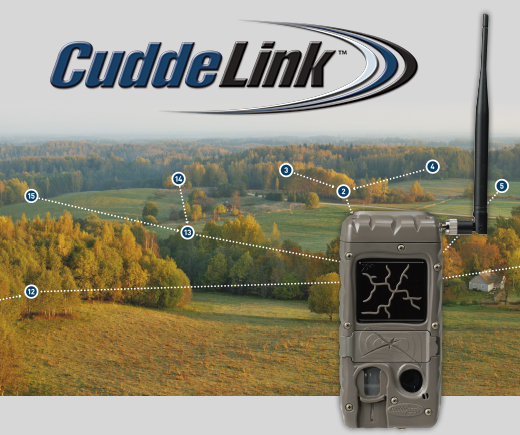 The Cuddeback Trail Camera - CuddeLink is not cell service or Wi-Fi. CuddeLink is a proprietary wireless mesh network that allows the cameras to communicate with each other. CuddeLink transmits images from remote cameras to a home image collection camera. CuddeLink networks can have from 1 to 15 remote cameras. Start with a few and add more cameras as you need them. Typical transmission range in a dense forest is ¼ to ½ mile. In open spaces CuddeLink has camera-to-camera range to over 1 mile. Like all wireless systems transmission range will vary with terrain and conditions. CuddeLink automatically daisy-chains cameras to extend range to over 4 miles, making CuddeLink deployable on properties of hundreds to thousands of acres. There is no monthly fee to collect images on the Home camera. The Cuddeback CuddeLink Cell makes cellular trail cameras affordable. Instead of a separate cell plan for each camera, CuddeLink Cell can send images from up to 16 cameras on 1 cell plan. Here's how it works. A CuddeLink network of cameras send their images to 1 home collection device that is equipped with a cellular modem. This cell device sends the images from all the remote cameras, so instead of 16 cell plans, you only have 1.